Trailerland started as a business in January 1981, specialising in providing trailer kits and parts for the DIY market throughout the South West – Cornwall, Devon, Somerset and Dorset. We then expanded into trailer manufacture but when demand increased we enlarged the range available by purchasing more general ranges of trailers direct from large volume manufacturers. We now have a stock of up to 100 trailers, the majority of which range from 4 ft (1200mm) x 3 ft (900 mm) to 8 ft (2400) x 4 ft (1200mm) and up to 15 cwt (750 Kg) gross capacity. This covers all uses from camping and DIY to heavy goods and builders. 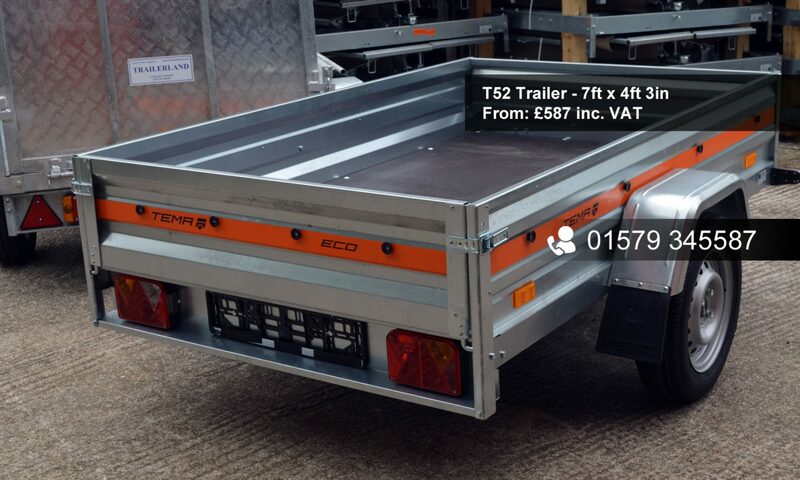 We also stock a small range of braked trailers up to 3.5 tons (3500 Kg) gross capacity. We have a range of Anssems trailers in stock plus a huge selection of our exclusive range of Warrior heavy duty trailers at incredibly reasonable prices. We also carry a wide selection of trailer parts in stock. If you have any queries or problems regarding trailers or towing, we are always pleased to help if we can. Please don’t hesitate to contact us. If you wish to visit, it is always advisable to telephone first. You will need directions which are available from the link above. Note for SAT NAV users: You may be directed down some very narrow lanes so our advice is use the narrative directions.